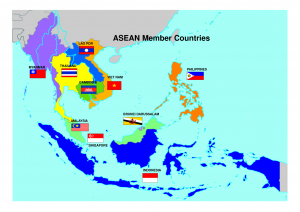 The ASEAN flag alongside ASEAN member nations. Photo courtesy ASEAN.org. Some of the ASEAN member states seem intent on deepening their cooperation past the economic field and into the political and military ones. Pertaining to the former, Vietnam is leading efforts in lobbying the group to form a united front in dealing with China, and officially speaking at least, ASEAN intends to sign a so-called ‘Code of Conduct’ with China sometime in the future. As is its norm, China prefers to deal with its territorial disputes on a bilateral basis with the specific states involved, shying away from addressing with them in a multilateral framework that could complicate the resolution of each individual issue. However, the ASEAN states involved in these disputes with China feel weakened by this approach, and they may be moving closer together amongst themselves in order to present the united front that Vietnam envisions. The risk is increasingly becoming real that ASEAN may experience an internal split between the maritime/coastal states with territorial disputes against China and those which aren’t party to the conflict, and the prospects of anti-Chinese military cooperation amongst some of its members make this problem an urgent one. Vietnam and the Philippines have just entered into a strategic partnership, which is only Manila’s third, behind the ones it has with the US and Japan, underlining the growing intimacy of ties between the two anti-Chinese states. The expectation is that both states will intensify their military coordination and form the basis of a Southeast Asian ‘NATO’ designed to counter China. It’s unclear at this point whether any other ASEAN members will sign up for the CCC, but it’s a certainty that Japan, and perhaps even India and Australia, will get in on the action. 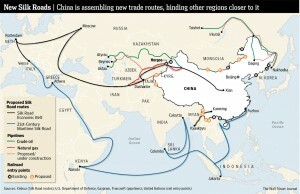 Anyhow, Vietnam and the Philippines’ growing antagonism towards China is leading to the de-facto integration of their South China Sea strategy towards Beijing (via American ‘Lead From Behind’ guidance per the Pivot to Asia) at the expense of ASEAN’s unity. It’s not forecasted that the organization will disband over this or even come close to such a scenario owing to its economic and good-neighborly roots (neither of the ASEAN states have any serious disagreements amongst themselves, except perhaps for Thailand and Cambodia), but such actions certainly handicap its further peaceful integration with all members and could perhaps prematurely stunt this development in general. Moscow’s presence in ASEAN is mostly centered on its full-spectrum relationship with Hanoi, which includes military, economic, and energy components. Russia is also close to Thailand, and its citizens contribute so significantly to its tourist and real estate sectors that both are expecting a notable decline this year due to the ruble’s slump. Moscow and Bangkok could even reboot their relations during Prime Minister Medvedev’s visit next month, which considering the expanding trade ties between the two (including in the agricultural sector), might likely happen. Andrew Korybko is a political analyst, journalist and a regular contributor to several online journals. He specializes in Russian affairs and geopolitics, specifically the U.S. strategy in Eurasia.